This article is NOT WRITTEN BY ME - this is written by Kerry Abrams and Brandon L. Garrett and I recommend checking out the original posting here. President Donald Trump’s executive order on refugees and noncitizens states that one of its purposes is to ensure that people admitted to the country “support the Constitution.” It’s clear from the rest of the order, which runs afoul of a number of constitutional provisions, that the president does not. How unconstitutional is the Trump executive order? Let us count the ways. Following initial victories won in court by tireless lawyers working at our nation’s airports, in the coming days a new phase of litigation will begin. Lawsuits will turn to the constitutionality of the entire order, and not just how it affects the scores of individuals unconstitutionally detained in the U.S., but all of those affected abroad. Many wonder whether early victories will last. After all, the president has substantial power to oversee immigration. But this order violates not just one but a gamut of mutually reinforcing constitutional rights—and that is why it should not last in the courts. As law professors who teach constitutional law and immigration law, we fully recognize that executive power over immigration has long been described by courts as broad, even “plenary,” and sometimes able to, well, trump the rights of noncitizens. Yet that power is also committed to Congress, which passed no law authorizing this order. And noncitizens still have constitutional rights, sometimes quite strong ones. 1. Equal Protection. This order raises discrimination concerns surrounding the Equal Protection Clause of the 14th Amendment, singling out individuals for their religion and nationality by focusing on seven predominantly Muslim countries. Additionally, our immigration laws already forbid such discrimination in issuing visas. 2. First Amendment. The order raises religious freedom concerns, including issues surrounding the ban on government establishment of religion. The law suspends admission of all refugees but asks the secretary of homeland security to “prioritize refugee claims” by members of a “minority religion” in a given country. This effectively means explicitly deprioritizing Muslim refugees in majority-Muslim countries. As Mark Joseph Stern has explained, the apparent preference for Christians of the order itself as well as Trump’s long history of comments supporting a “Muslim ban” will not help the law’s success in the courts. 4. Habeas Corpus. 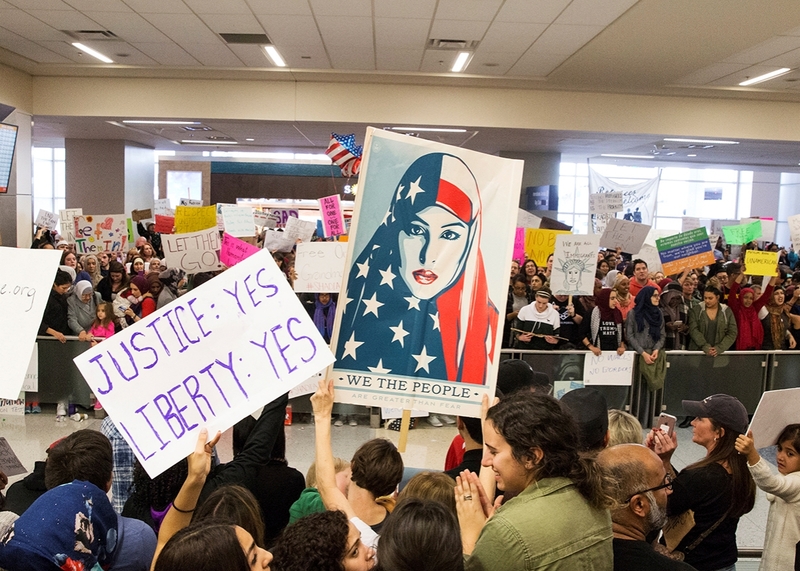 Lawyers at airports have been filing habeas corpus petitions around the clock for people being detained. In recent years, the Supreme Court strengthened the protections of habeas corpus for noncitizens repeatedly in rulings in cases brought by Guantánamo detainees. Less known were earlier rulings strengthening protections for noncitizens in detention facing removal, such as Zadvydas v. Davis. The national security or “plenary” power over immigration did not faze the justices in such rulings. 5. Family Reunification Rights. * The tragic stories of separated families bring out yet another constitutional right at stake that few have commented on: The Supreme Court has repeatedly recognized the importance of the fundamental right to family relationships. Family reunification is also of primary importance in immigration law. Uh, why read here then? Articles are generally never taken down to silence speech.